Today is the start of a new challenge at 7 Kids College Fund Challenge Blog, our theme is Anything Goes. The Design Team has chosen to get out our new CHA 2014 goodies and show them off. I have a few on my card that I would like to share with you. My favorite CHA 2014 is the High Heel shoe from Tattered Lace and Heart doily from LaLa Land and of course Pion papers to add the elegance. 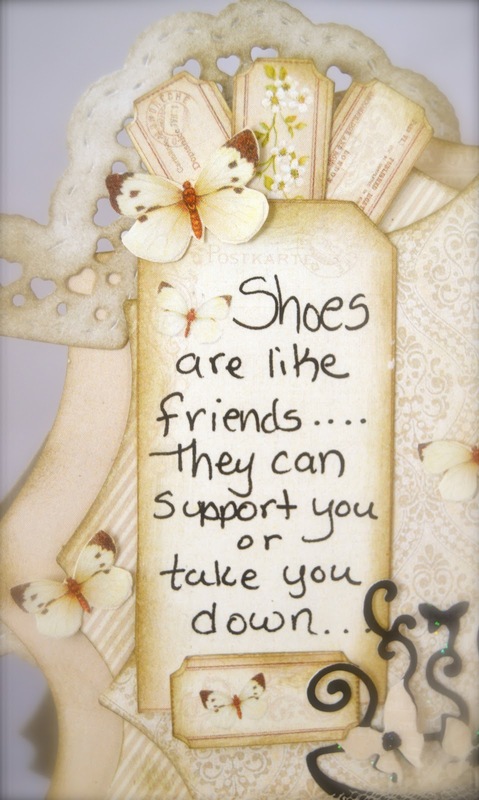 I love shoes, love them!! My back cannot stand them, therefore, no fun for me. Oh well, I do like to admire shoes and my Facebook followers know when I am on as I "LIKE" all the shoes, one after the other, like a game they come at me. Addictive and purses too. I won this Tattered Lace die, High Heel Glam from the owner of the 7 Kids College Fund Store so I was pretty happy with that! It is delicate with the bonus feature of butterflies! I saw this saying on Pinterest and I hope not to offend but sometimes these things are true. It actually made me laugh as women can be pretty catty. My tag is decorated with small elements from the Pion paper line and edged with Distressed Ink. I put layers of pleated tulle down and the crocheted and pearl lace on top. I wanted a elegant feel. Magnolia doohickey swirly butterflies blend in with the Pion ones and add more elegance. I had no black pearls so used Onyx liquid pearls and they look just as nice. 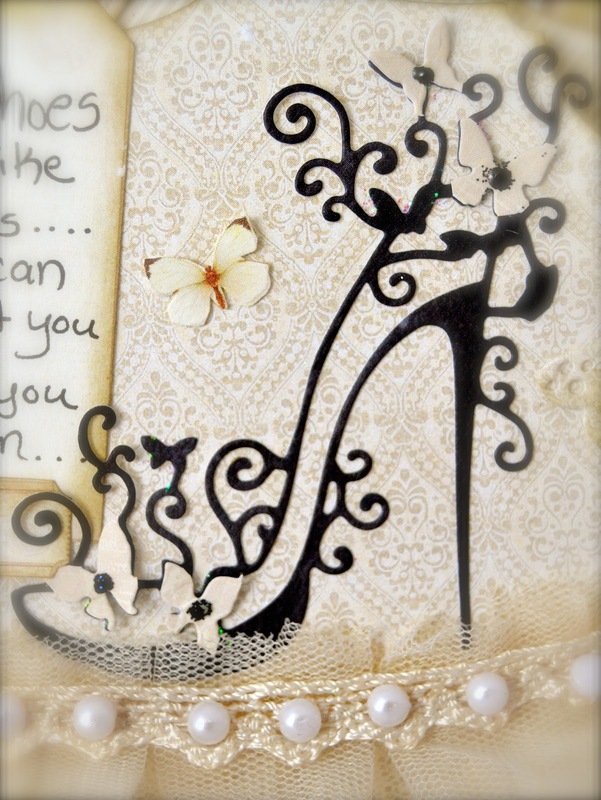 A girl can never have too many shoes, in die cuts also! Tattered Lace has more!! Hope to see you enter our newest challenge at 7 Kid College Fund Blog and enter to win the $20.00 gift certificate to the 7 Kids College Fund Store. That looks like a Hollywood shoe! Beautiful or not, I can assure you that if I wore shoes like that, they would definitely take me down! Wow ! Amazing ! 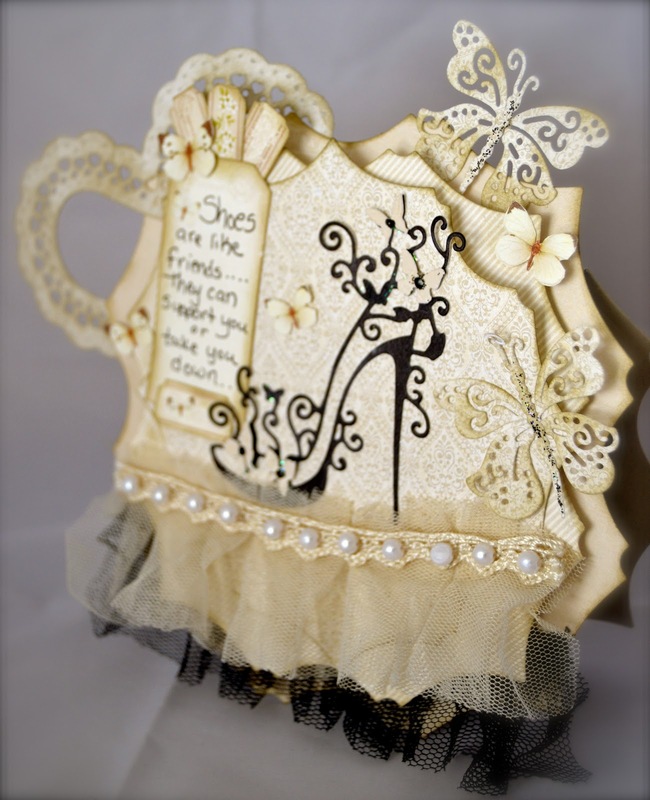 Such a wonderful creation with so fab details ! So prettyyyyyyyyy ! I love this Kelly! Love the colour and all the layers and that fabulous shoe die... that is wonderful! Great sentiment too and those little butterflies are very pretty! Hello Kelly! I nominate you wonder woman of the year! Only you can travel and produce gorgeous cards. This one is a real show stopper. I too am a lover of shoes (that's the other addiction) . LOL! Sad to say I can no longer wear shoes like the one you used. It's beautiful to look at though. Your design is awesome and of course I love it all! Such an elegant card! Love all the frills and that shoe is awesome. Talk to you soon! Such a beautiful feminine card! 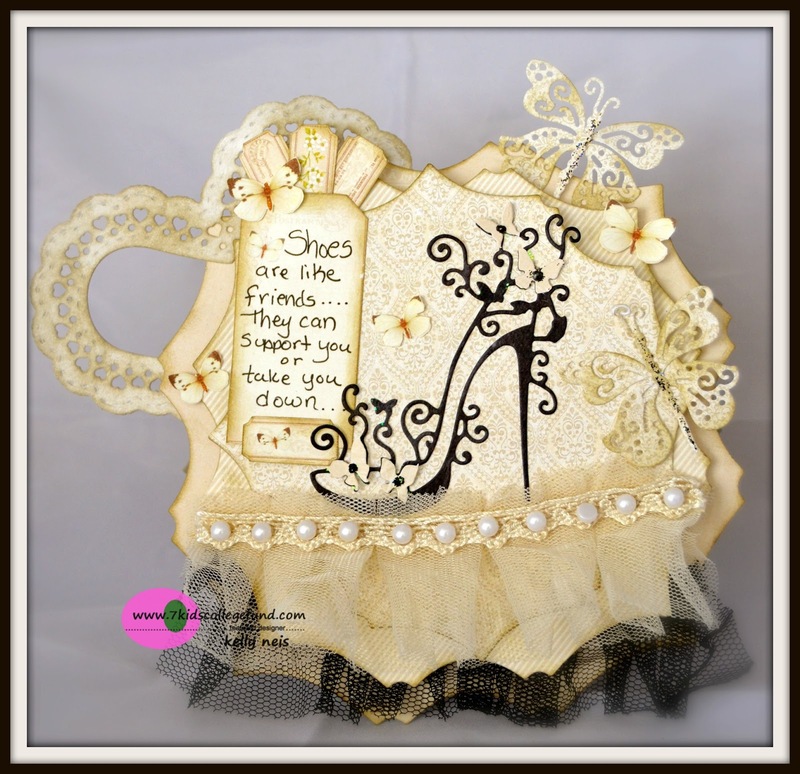 I love the lace and pearls and so perfect with the fancy high stepping shoe! Enjoy the weekend! I'm ashamed. I only have 4 pairs of shoes. Isn't that sad? I've never been one to understand shoes or purses or jewelry. I do however LOVE art using those items...how odd. Your project is sensational Kelly and that sentiment..LOL..so true!! Frilly, lacy, feminine glamour galore - what a treat!